Our knowledgeable and experienced team ensures that pruning is performed at the appropriate time during the growing cycle, and that proper pruning techniques are used. Typically pruning is done in the Spring and the Fall. The Spring pruning is generally geared towards proper shaping, thinning, and cutting back dead growth. Fall pruning is done once the plant life has gone dormant for the winter. The goal is to remove any dead growth and help ensure that your plant life will come back healthy and looking better than ever the following Spring. Some customers also desire light Summer pruning in order to ensure their shrubbery maintains a tightly shaped and crisp appearance. We also offer various pesticide free fertilization products to keep your plant life healthy and free of unwanted pests. Every type of plant has its own specific needs. 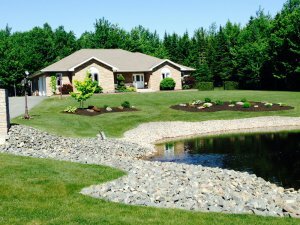 When selecting a landscaper it is essential to hire trained professionals that possess the knowledge and skills to properly care for your plant life. We offer several gardening services to help keep your shrub, flower, and perennial beds looking their best. 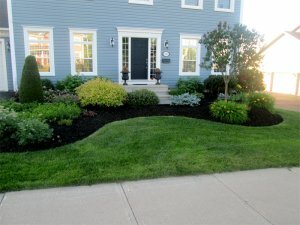 We offer edging, weeding, cultivation, and several other general shrub/flower bed maintenance services. Whether you require a one time, seasonal, monthly, or bi-weekly visit Turf Works will get the job done! 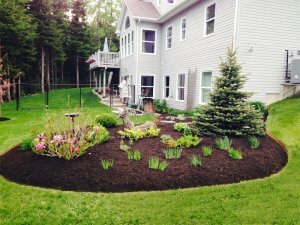 Nothing improves the look of your beds more than adding fresh garden soil or bark mulch. We offer several different colours and types of bark mulch. 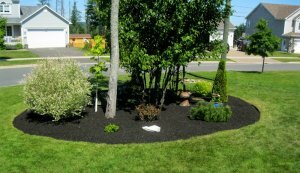 Only premium quality soils and mulches are used on ALL of our jobs. 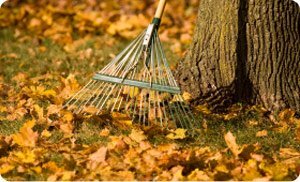 Our seasonal clean-ups include any and all of the services listed below. You simply tell us what you want, and we’ll make it happen! We offer several different types of tree services. Our services include tree and brush removal, stump grinding, and hedge trimming.